The National Science Foundation (NSF) just posted an interesting and very readable article by a graduate student who traveled to China to make nanostructured thin films for solar cells. Meghan Schulz, a gradute student at the University of Delaware, was part of the NSF's Integrated Graduate Education Research Traineeship (IGERT) program. The program at the University of Delaware trains students to develop with cross-disciplinary solutions to the energy problems we're facing today. 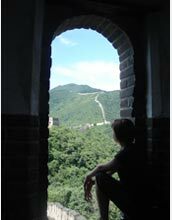 Meghan spent the summer in China completing the international internship component of that program. "'Nanostructured thin film' is a fancy way of referring to a very, very thin layer of some specialized material--less than 1/100th of the thickness of a piece of paper. "Thin films have two major advantages: one, you use a very small amount of material, which is handy if the stuff is expensive. And two, the rules governing materials behavior tend to change when structures get down to the nanoscale; this can lead to greatly improved optical or electronic properties compared to a bulk material." Thanks to Troy Livingston at the Museum of Life and Science in Durham, NC for sending me the link!